The strongest collection yet from this widely praised poet is about the central players in our lives, our relationships over time—between mother and son, mother and daughter—and how one generation of relationships informs and shapes the next. The opening sequence, “Manhood,” looks at the insular world of baseball, shedding light on the complexities of gender, boyhood, and coming-of-age. 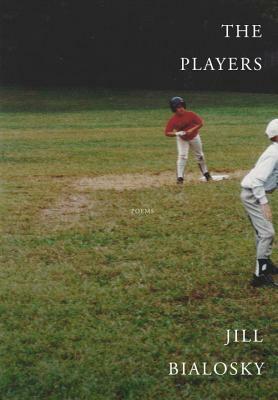 The poet captures the electrifying, proud language of baseball talk, channeling the tone and approach of the young men she observes as a mother, and bringing poignancy and deeper understanding to the transaction between herself and the young men she sees growing into adulthood. “American Comedy” is a sonnet sequence about the absurdities and realities of modern domestic life, while figures in literature are the players in “Interlude.” The final section, “The Players,” becomes a forceful and searing revelation about the legacy of generations. Exploring the nature of attachment on many levels, The Players brings us Jill Bialosky at her best, in poems that find a new language to describe the rich and universal story that is modern motherhood. JILL BIALOSKY is the author of three previous poetry collections, The End of Desire, Subterranean, and Intruder. Her poems have appeared in journals such as The Paris Review, The Kenyon Review, The New Yorker, and The Atlantic Monthly. She is also the author of several novels and the recent memoir History of a Suicide: My Sister's Unfinished Life. An editor at W. W. Norton, she lives in New York City.